Finding the best corn seeding rate is important for efficient production. The “optimum” corn seeding rate—the one that maximizes profitability—can vary within and among fields with small differences in soils and weather. Given the advances in agronomic production and breeding, it is important to know how practices such as variable rate seeding with modern hybrids may affect profitability. While adoption of variable rate technology is increasing, there are still questions related to how variable rate seeding changes seeding rate, yield level, and profitability compared to using a uniform (or fixed) seeding rate. In order to help estimate the profitability of variable rate corn seeding in the U.S. Corn Belt, we used results of recent seeding rate research to see how variable the response to seeding rates is, and to see if factors like yield level might help us do a better job of setting plant populations. We used data from corn seeding rate trials conducted from 2012 through 2016 in Ohio (93 trials) and Illinois (32 trials) for this analysis. Each trial consisted of small plots (30-inch row spacing; 10 feet [4 rows] wide by 24 or 40 feet long) with three or four replications of four to six seeding rates ranging from 18,000 to 50,000 seeds per acre. Most studies in Ohio were planted between early May and early June, and most in Illinois were planted between mid-April and early May. Yield and harvest moisture was collected from the center two rows after maturity, and yields were adjusted to 15.5 percent moisture prior to analysis. 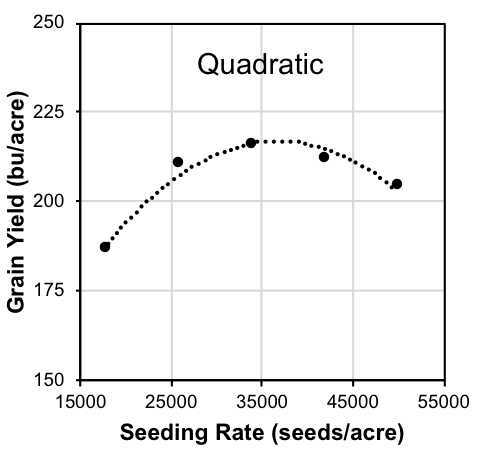 Each trial’s response to seeding rate was characterized as having a linear, quadratic, or quadratic-plateau shape (Figure 1). The economic optimum seeding rate (EOSR, or seeding rate resulting in the greatest profit) was calculated for each trial assuming a seed cost of $3.00 per thousand seeds and grain price of $3.75 per bushel. We then converted each yield response to a “return-to-seed” (RTS) response by taking yield at each seeding rate times $3.75 per bushel, and subtracting the cost of seed at each rate. We averaged the RTS curves across all the trials and took the seeding rate that produced the high point of the resulting curve as the best uniform optimum seeding rate (UOSR) for each trial. Figure 1. 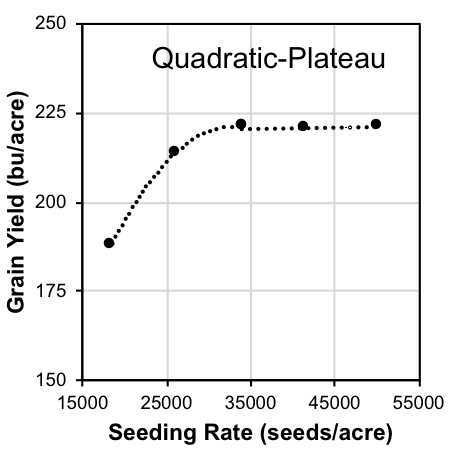 Typical responses of yield to seeding rate. To find out how much value there was in using EOSR within each trial compared to using a uniform seeding rate across all trials, we subtracted the RTS at the UOSR from the RTS values averaged over all of the trials within each state. In other words, we pretended that the individual trials were each part of the same field, and we calculated how much benefit there was to having the population “just right” for each part of the “field” compared to using the same population across the whole field. Most environments in Ohio showed a quadratic yield response to seeding rate (Figures 1 and 2), meaning that most yields were lower at the highest seeding rates compared to medium seeding rates. The EOSR values in Ohio trials ranged from 18,000 to 44,340 seeds per acre, with an overall average of 32,129 seeds per acre (Table 1). Yield at the EOSR ranged from 117 to 271 bushel per acre (205.5 bu/acre average), which resulted in an RTS range of $360.23 to $899.99 per acre with an average RTS of $673.52 per acre. The UOSR and average yield at the UOSR across the Ohio trials were 32,721 seeds per acre and 202.6 bushels per acre, respectively, with an estimated RTS of $660.99 per acre (Table 1). While the difference of 542 seeds per acre between EOSR and UOSR was not statistically significant (P = 0.351), the yield difference (2.9 bu/acre) from using the EOSR (variable seeding rate) compared to using the UOSR was significant (P < 0.01, Table 1). Based on this analysis, the estimated RTS advantage from using the EOSR in each trial was $12.53 ac-1, with 86 percent of the greater return coming from greater yield and 14 percent coming from lower seed cost (Table 1). Table 1. Average economic optimum seeding rate (EOSR) and uniform optimum seeding rate (UOSR) for the Ohio trials. The Difference column shows the UOSR subtracted from the EOSR values. †ns indicates paired t-test P > 0.05, *indicates paired t-test is significant at P < 0.05, and ** indicates significant at P < 0.01. The results in Illinois differed from those in Ohio, mostly because yield responses were flatter in Illinois than in Ohio, and yields seldom dropped at the higher seeding rates; the most common shape of response in Illinois was the quadratic-plateau (Figures 1 and 3). The EOSR in the Illinois trials ranged from 24,020 to 40,640 seeds per acre with an average across trials of 33,781 seeds per acre (Table 2). Yield at the EOSR ranged from 132 to 268 bushels per acre (226.6 bu/acre average), with an estimated RTS average of $747.62 per acre (range of $423.33 to $911.14/acre). The UOSR for Illinois trials was 33,704 seeds per acre, with the average yield across trials each at the UOSR of 225.7 bushels per acre and an estimated RTS of $744.48 per acre (Table 2). Neither seeding rate nor grain yield differed significantly for the EOSR compared to the UOSR, but the combination of increased seeding rate and grain yield resulted in an overall significant RTS advantage of $3.14 per acre. The advantage from using the EOSR came from the small (0.9 bu/acre) yield increase (worth $3.37) minus the very small increase in seeding rate (77 more seeds per acre worth $0.23). Table 2. Average economic optimum seeding rate (EOSR) and uniform optimum seeding rate (UOSR) for the Illinois trials. The Difference column shows the UOSR subtracted from the EOSR values. These results show that optimizing seeding rate by using the best rate for each part of a (hypothetical) field compared to a uniform rate across the “field” was more profitable for the Ohio sites compared to the Illinois sites. 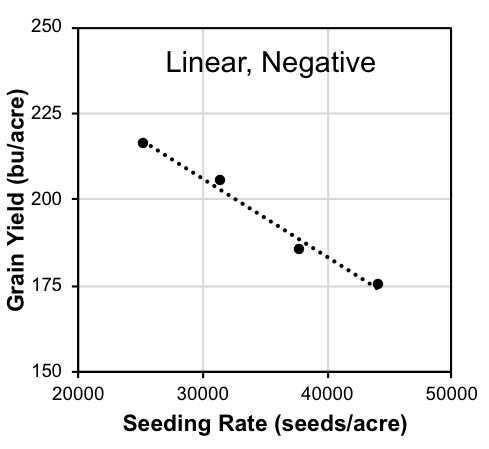 The optimal seeding rate in Ohio ranged more widely (more points at the higher and lower ends of the range), which increased the penalty from using a fixed seeding rate (UOSR). Additionally, 80 percent of the Ohio trials were quadratic (or linear with a small or negative slope) meaning that there was a greater penalty from using a seeding rate above the EOSR compared to sites with a quadratic-plateau response. In contrast, responses in 53 percent of the Illinois trials were in the shape of the quadratic-plateau curve. 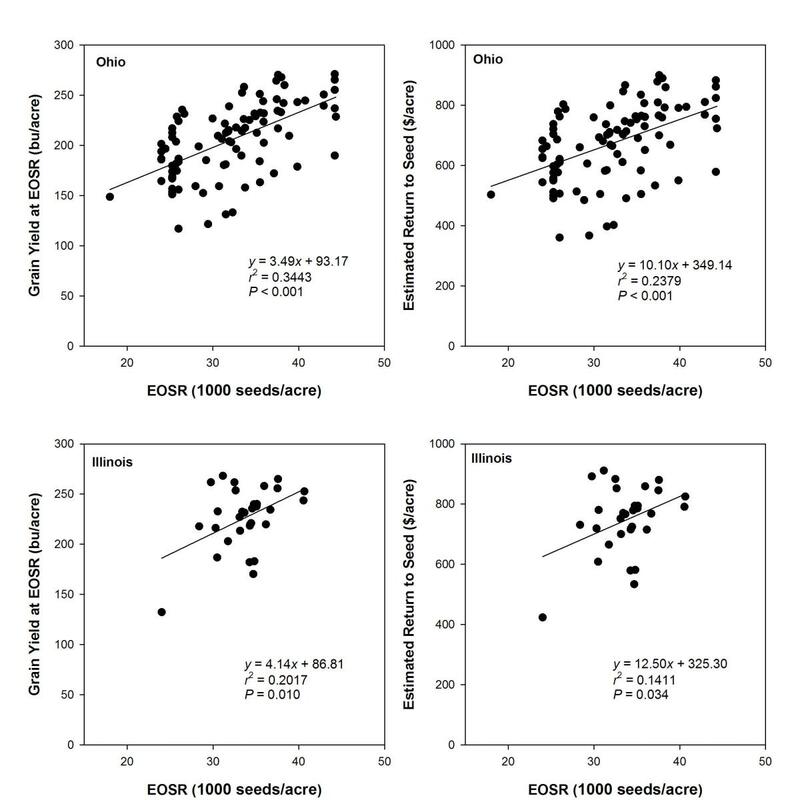 In both Ohio and Illinois, the fact that there is a linear relationship between EOSR and yield or RTS (Fig. 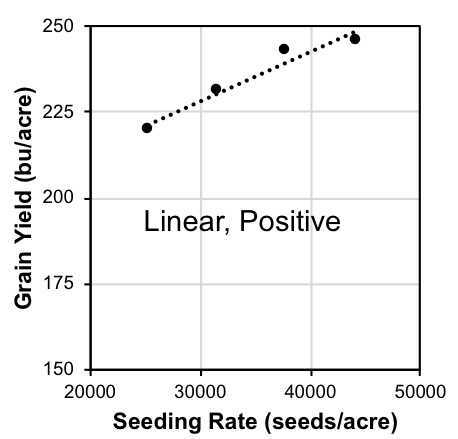 4) indicates a possible advantage of using yield potential to vary seeding rates within a field. 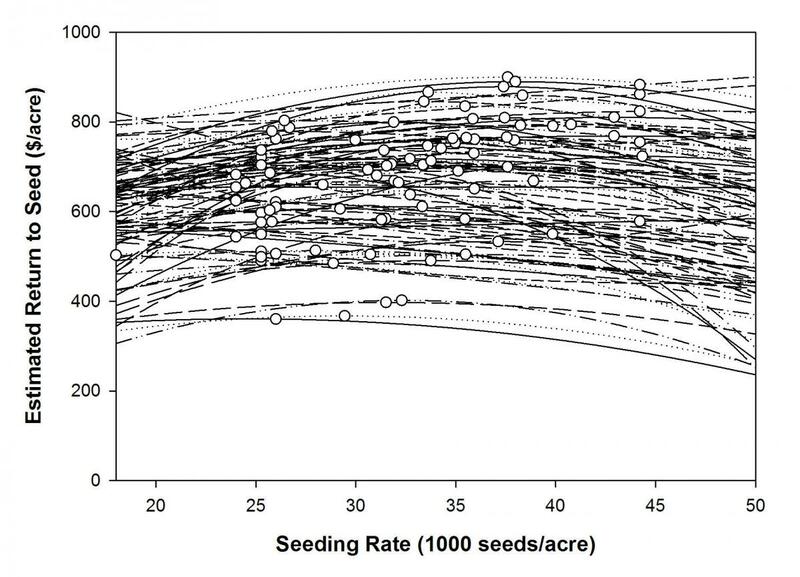 However, these relationships were relatively weak (large variance in data, low correlations) and it looks like medium- to high-yielding environments tended to show relatively flat yield responses to increased seeding rate; in other words, it was the low-yielding sites that made this “work.” This hints at the difficulty of accurately predicting site specific “best” seeding rates needed for fully efficient variable rate seeding practices. These results are similar to those recorded in Indiana, where population responses generated in field-scale trials were also relatively flat (Nielsen et al., 2017). Finding specific management zones may be possible using various soil characteristics (Licht et al., 2015), but it may take a lot of time and effort to identify consistent patterns under different crop rotations or tillage regimes (Bunselmeyer and Lauer, 2015). Modern techniques that utilize yield map history and in-season thermal imagery may be able to predict or identify areas of consistent yield levels (high, medium, low) and stability (stable vs. unstable), which should improve the accuracy of the process (Maestrini and Basso, 2018). However, weather variability within seasons will continue to be a problem. We also found what seems to make sense—that the profitability of variable-rate seeding will be higher in fields with a mixture of lower- and higher-yielding regions (say from above 180 bushels per acre to less than 100 bushels per acre) than in more uniform fields (Lowenberg-DeBoer, 1999). We found returns on the low end of the range similar to those reported in the popular press ($8.80-34.52/acre; Hest, 2011); this may have been due to site selection or to differences in growing conditions. There is potential for modest increases in profitability from optimization of corn seeding rate in environments with a range in yield levels. Predictions of optimal seeding rates within a field and year will need to improve beyond current levels before estimated RTS of this level will be approached. Small changes in seeding rates may be needed to impact profitability, but obtaining this resolution on small spatial scales is a challenge that will need to be addressed in future research. The work of Darin Joos, Joe Davlin, Matt Davis, Allen Geyer, and Rich Minyo, who planted and harvested the trials, is gratefully acknowledged. Bunselmeyer, H.A., and J.G. Lauer. 2015. Using corn and soybean yield history to predict subfield yield response. Agron. J. 107:558-562. Hest, D. 2011. Variable rate seeding has variable payoff. Farm Industry News. farmindustrynews.com/variable-rate/variable-rate-seeding-has-variable-payoff. Accessed 1 June 2018. Licht, M.A., A.W. Lenssen, and R.W. Elmore. 2017. 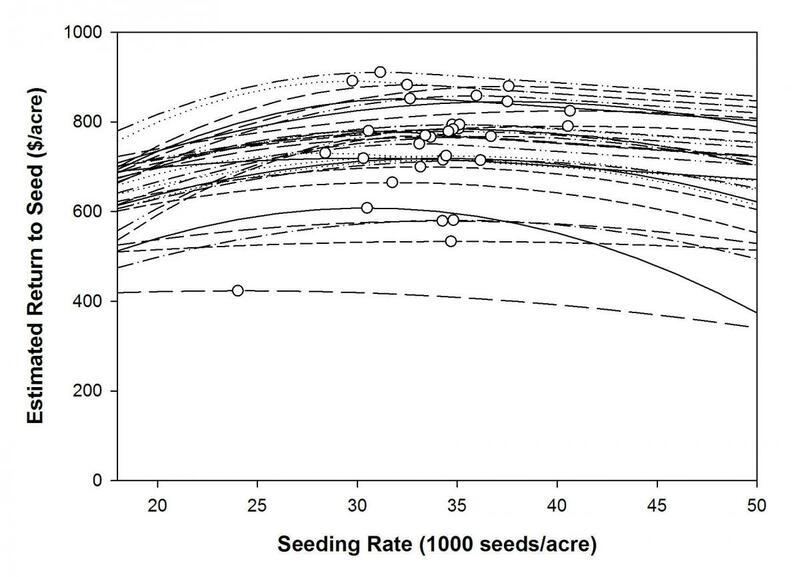 Corn (Zea mays L.) seeding rate optimization in Iowa, USA. Precision Agric. 18:452-469. Lowenberg-DeBoer, J. 1999. Economics of variable rate planting for corn. In P.C. Robert, R.H. Rust, and W.E. Larson (Eds. ), Proc. of the Fourth International Conference on Precision Agriculture (pp. 1643-1651). Madison, WI: American Society of Agronomy. Maestrini, B., and B. Basso. 2018. Predicting spatial patterns of within-field crop yield variability. Field Crops Res. 219:106-112. Nielsen, R.L., J. Lee, J. Hettinga, and J. Camberato. 2017. Yield response of corn to plant population in Indiana. West Lafayette, IN: Agronomy Department, Purdue University. agry.purdue.edu/ext/corn/news/timeless/CornPopulations.pdf. Accessed 21 Dec. 2017.